The capacitive measuring systems reach their limits with larger travel ranges: Either the sensor surfaces become larger or resolution and linearity diminish. Precision positioning systems which achieve travel ranges of several 10 millimeters, use incremental encoders as position sensors. Position sensor configuration with indirect determination of the platform motion. Most often, the sensor is integrated in the drive train, for example, by means of a rotary encoder on the motor shaft. The advantage is an easier attachment of the sensor. However, if motion is only measured indirectly at the drive side, backlash and mechanical play will affect the measured result. A rotary encoder is implemented at a rotating point in the drive train, e.g., the motor shaft. To determine the relative position, the controller counts the encoder signals (impulses). To measure the absolute position, a limit switch or reference point switch signal must be used as reference. A typical step width of rotary encoders is approx. 0.1 µm. Contact-free optical linear encoders measure the actual position with utmost accuracy directly on the moving platform (direct metrology). Errors in the drive train, such as nonlinearity, mechanical play and elastic deformation, are therefore not considered. With linear encoders a resolution down to the nanometer range can be achieved. 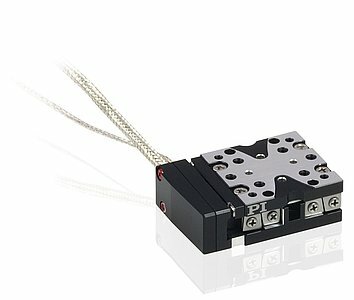 Absolute encoders deliver additional information about the absolute position of the moving platform. 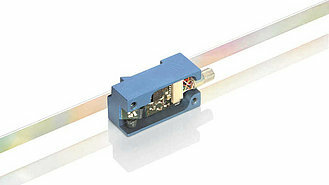 Tachometers are used for measuring and controlling velocity. Alternatively to a direct measurement, the time course of the position data from the encoder can also be used for velocity control. The PIOne linear encoder employs a patented technology: the measuring head of the PIOne contains a Mach-Zehnder interferometer, which is moved along the linear scale.